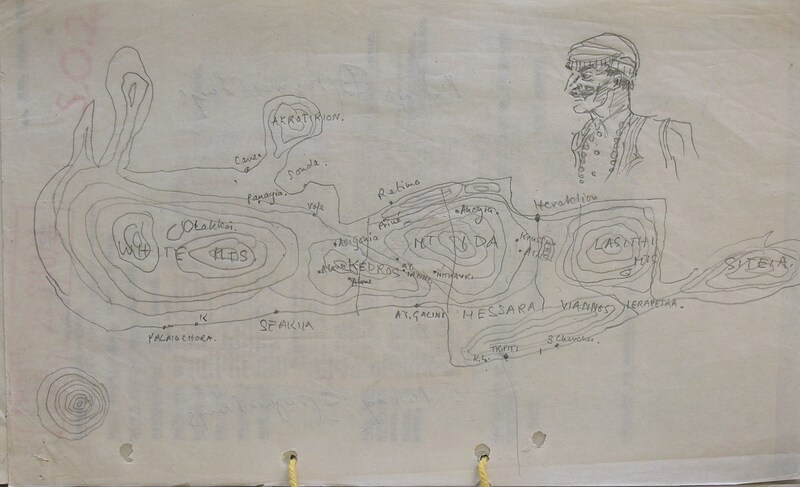 This map was hand drawn by Paddy, probably whilst on operations in Crete 1943-44, including a self-portrait. 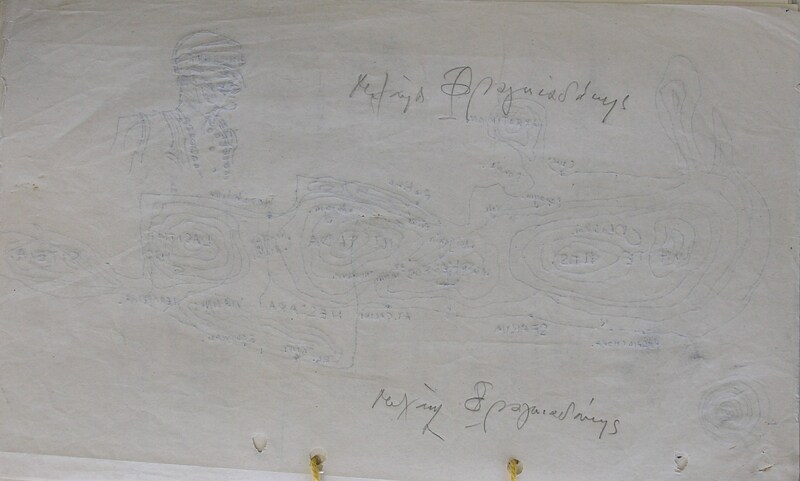 The map is from Paddy’s SOE file. First published on this blog in 2011, I am republishing it as part of a series of unique materials on the blog to tie in with the 70th anniversary year of the kidnap and the recent publication of Paddy’s own account. Click on the pictures to zoom. 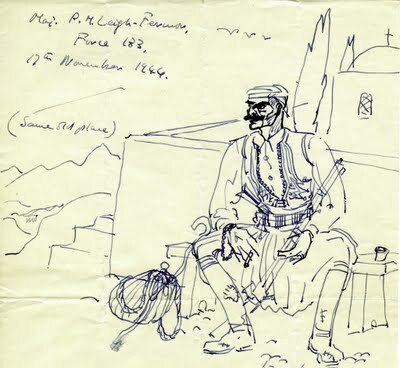 This delightful sketch of himself in Cretan dress was penned at the top of a letter to my mother dated 17th November, 1944; as he explains, “I have been lost again in a forest of whiskers for about three weeks, and my old mountain chums are down in the plains now, looking incredibly wild and shaggy”. This entry was posted in Abducting a General, Ill Met by Moonlight and tagged Crete, Ill Met by Moonlight, Patrick Leigh Fermor, SOE on October 16, 2014 by proverbs6to10. You probably know by now but PLF explains in the Introduction to The Cretan Runner that Michali Frangiadakis was the name on his forged identity card. So it was, literally, a nom de guerre. Signature in Greek on reverse appears to read : “Mikhaíl Frangkiadhákis” [Μιχαήλ Φραγκιαδάκης] ‘Frángkos’=”a Frank; West European”. Presumably another of Paddy’s noms de guerre, in addition to “Philedem”? Often a flock of birds amongst the clouds in those he kindly signed for me. Those lucky enough to own presentation copies of PLF’s books might find anything from a plain doodle to some lovely little sketches, sometimes quite accomplished and not so little either. I know people could say it’s “flogging a dead horse” , but I wonder if Paddy’s estate could cobble together a book of his sketching of people and places with some footnotes?